More Moccasins on the Ground: What Solidarity Looks Like! 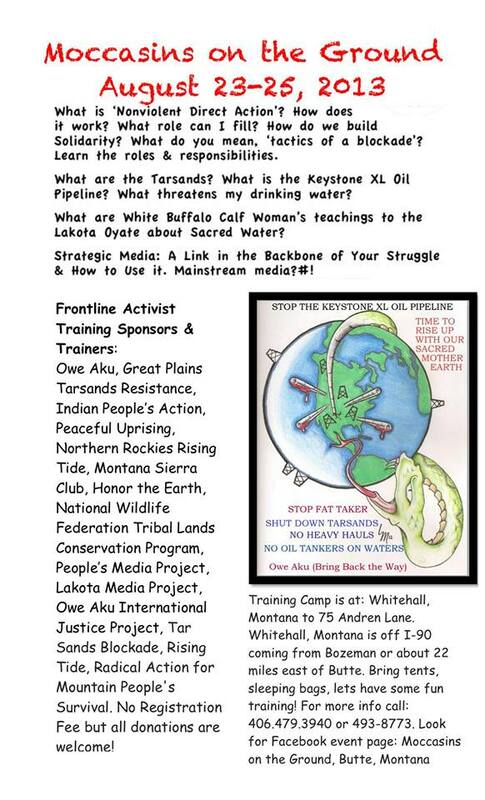 [The Keystone XL tar sands pipeline] is one of the biggest human rights violations in this country. They’re cutting through thousands and thousands of our cultural sites. They’re violating our nation-to-nation agreements. They’re disregarding our children and families who said no, stop. And above all, they’re violating the generosity that we made to the US government by making these treaties. Because essentially these people were homeless and jobless, and they had no where to go. So we opened up our lands to them, and this is what we get. In June, we asked for your support to bring Utah indigenous people and allies to the Moccasins on the Ground action camp in Eagle Butte, South Dakota. Many thanks to those of you who answered the call for Climate Justice SOLIDARITY! We need YOUR HELP to support participants’ travel to these camps. (In the box “Why Do you support PeaceUp?” please put the word MOCCASINS). In many cases—including this one—receiving funding from generous donors is the only way that our people can participate and organize; we don’t all have resources of our own. Do not confuse this with a plea for charity. Landless peasants from all over the world benefited from the genocide of indigenous people across these occupied territories called the United States and Canada. When American Indian tribes sometimes signed treaties with the US government which sometimes allowed new white settlers to stay on tribal lands–that was charitable. So working today to mend damage and stop the genocide of indigenous people is not charity; it’s justice and solidarity. More than justice, it’s also smart. Donating to climate justice projects that link people of different classes, races and bio-regions in a united struggle to stop massive destruction of the earth and its inhabitants is a exceedingly strategic donation. Because the movement’s power comes from our unity, our movement is only as resilient as our hungriest neighbor, only as strong as our most hurt friend. The climate justice movement agrees with the old IWW adage: An injury to one is an injury to all. To do that, years of broken treaties, environmental racism, and even racism within environmentalist movements will have to be sutured so that newfound solidarity can rise. This climate justice work also needs to be dual pronged: while we join with indigenous people and other especially oppressed people in resisting annihilation, we also need to work with them to build stronger communities that make all of us more formidable in the next fight. CLICK HERE to DONATE to this IMPORTANT CAUSE. We’ve been very fortunate to receive support and true solidarity from our indigenous allies, as they responded to our call last month. They joined us for the first ever tar sands action camp in Utah, which led to a very successful mass action (the first of its kind) on the first commercial tar sands mine site in the US. We are fearless—and this will be a Fearless Summer in which we escalate our tactics to protect our Earth and to protect our communities.